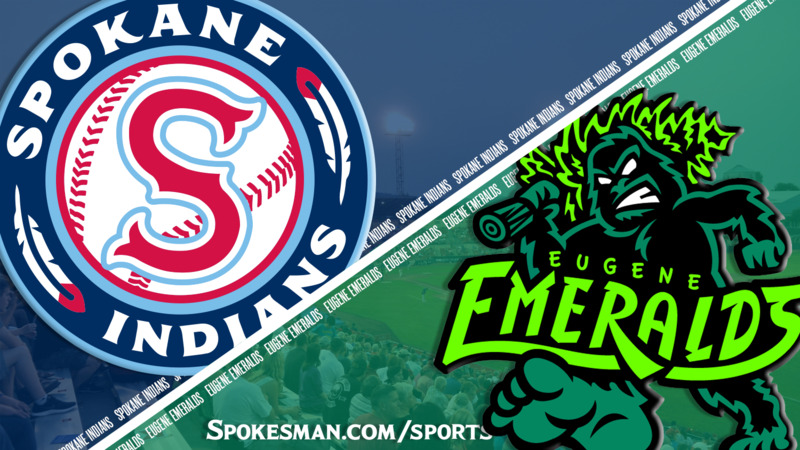 Sat., Aug. 4, 2018, 10:30 p.m.
EUGENE – The Spokane Indians’ first hit Saturday night was the only one they needed. Francisco Ventura’s bases-clearing double in the fourth inning sparked Spokane to a 7-2 win over the Eugene Emeralds in Northwest League play at PK Park. Eugene starter Eury Ramos (1-2) retired the first nine Indians he faced but ran into trouble in the fourth with back-to-back walks and a hit batter. Ramos struck out the next two batters and had a 3-2 count on Ventura when the Indians catcher cleared the bases with his double to right field. The Indians added four runs in the sixth, aided by back-to-back throwing errors by Emeralds third baseman Grant Fennell. Diosbel Arias had an RBI single during the inning, and Ventura picked up his fourth RBI on Fennell’s bases-loaded force attempt. Spokane (7-5 second half) remained tied for first place in the North Division with Everett and Vancouver. Eugene, of the South Division, dropped to 5-7. Spokane starter Jake Latz (4-1) allowed four hits and two earned runs in 5 2/3 innings, striking out nine and walking three. Indians relievers Wes Robertson, Brett Eibner and Emmanuel Clase combined for 3 1/3 scoreless innings, allowing two hits and walking none. Ramos took the loss, although he allowed just Ventura’s hit. He was charged with three earned runs in 3 2/3 innings, striking out six. The Emeralds outhit Spokane 6-3. Jake Slaughter led the way, finishing 2 for 3 with an RBI. The teams have split the first four games of the five-game series. Spokane clinched the season series with its sixth win in nine games. NWL All-Stars will meet Pioneer League All-Stars at 5:40 p.m. Tuesday in Grand Junction, Colorado. Published: Aug. 4, 2018, 10:30 p.m.